The Absolute Best Flats Fishing Charters in Homosassa, Chassahowitzka, & Crystal River. 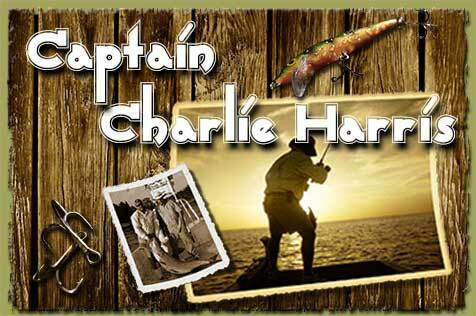 I'm Captain Charlie Harris, a 3rd generation native of the Homosassa and Crystal River area, and a full time guide. I specialize in fishing for inshore species such as Redfish, Tarpon, Trout and Cobia. If you'd like to charter a guide to go Florida flats fishing in the Homosassa Springs or the Crystal River area, you have come to the right place. Redfishing is my specialty. I cater to both the light spinning tackle and fly fishermen. I have been fishing the waters around Citrus County for 30 years, as both a commercial fisherman and a charter captain. The many years that I have spent commercial fishing these waters have made me quite knowledgeable about the Nature Coast and the Big Bend area. This knowledge lets me place my clients on to fish at the right time, tide, and place. My boats is a 21 foot Carolina Skiff, that I have set up to fish the Florida flats and backwaters of our area. It has a poling platform, and a bow mounted, silent, electric motor to insure that I can quietly get into those hard to find shallow areas, which hold the big redfish. 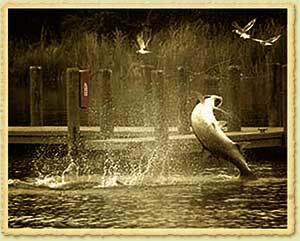 The sight of redfish tailing or a Tarpon swirling the flats of Homosassa, is one, that both my clients and I find to be the ultimate thrill in Florida flats fishing. The boat has a 115hp Yamaha engine that is extremely reliable and that gets me to the flats just plain fast. This boat fishes up to 4 anglers in comfort. 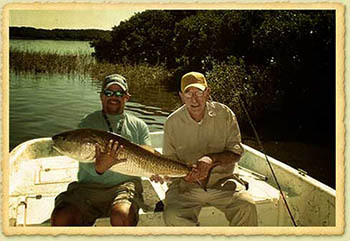 Testimonial: Just finished a day of fishing with Capt. Charlie, wow, what a day. When Charlie tells you where and when the fish are going to bite, he knows what he's talking about. We left the docks a little early to be able to catch the incoming tide. Once we arrived at a beautiful spot, we made a few casts, and enjoyed the beautiful weather. As soon as the tide started to move in, we were on the fish! Caught my limit of Sea Trout in no time, and boated some real beauties. I can't recommend Capt. Charlie highly enough, he IS the "Fish Whisperer". ~Tom F.
My boat is equipped with all the Coast Guard required safety equipment. All bait, tackle and licenses are provided for your fishing charter. Fishing stories, local wisdom, memories and angling adventures are also provided as part of the package. We can also provide a nice shore lunch of the day's catch, which is cooked and enjoyed right on the banks of the beautiful Homosassa waters. Want to see the real Nature Coast? If so, the boat I use is a "Gator Tail". These boats are built in Louisiana, and designed for the swamps and backwater areas of our rivers and the gulf coast. This boat will take you to places where only airboats can go, but without the noise. 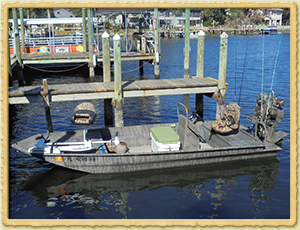 It is a fun ride, and it can cross mud, shallow waters, or oyster bars, and get you back where the wildlife is hiding. I enjoy taking people on nature cruises of our area to see the manatees, wildlife and great natural beauty that surrounds Homosassa and Crystal River. With miles of backcountry, crystal clear fish-filled waters, there is an abundance of large redfish, trout, cobia and tarpon waiting to challenge the best of light tackle anglers. The redfish are powerful and are famous for their never tiring fighting ability. The Nature Coast area has an abundance of inshore species to challenge the seasoned angler and to permit the less experienced family/party members to participate in the enjoyment of fishing our inshore waters. My fish information section lets you research the many fish we catch on our angling adventures in the area. Tarpon fishing for the area is in May, June and July. 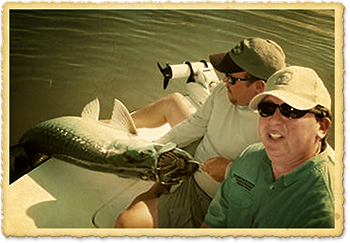 The area provides the world's best Tarpon sport, with several fly rod records on the books. Speckled trout remain one of the most sought after fish and they are available year round. Come join us, and enjoy some of the best fishing this part of the country has to offer. There is something for everyone on the family vacation to our West Central Florida area. I am a member in good standing of the Homosassa Guide Association. I can provide boats and qualified, experienced charter captains for your corporate and family outings. The area abounds in natural beauty and is an abundant year round fishing resource.